(February 19, 2014- Boston, MA): Mike Lake, Democratic Candidate for Lt. Governor, was officially endorsed by Governor’s Council member Eileen Duff. 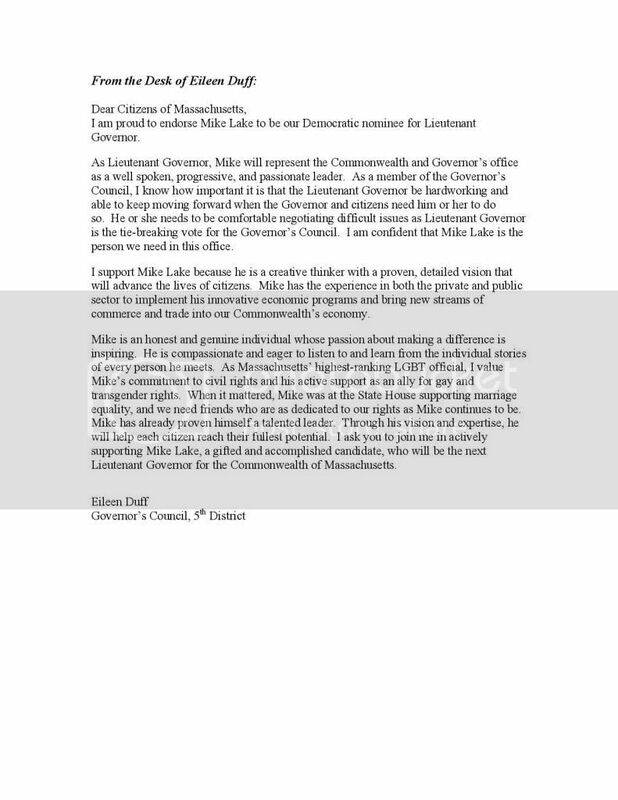 Duff, the fourth elected official to endorse Lake in 2014, outlined the reasons why she believes Mike is the best candidate for Lieutenant Governor saying he has the experience, work ethic, and perseverance necessary for the position. Duff—Massachusetts’ highest ranking LGBT official and host committee member of Lake’s March 6 fundraising event at Club Café—praised Lake’s enthusiastic commitment to civil rights and his constant support of the LGBT community both before and after the recognition of marriage equality as exemplified by his presence at the State House during the 2004 vote. "As a long time ally for LGBT rights, I'm particularly proud to have the support of Eileen Duff, our highest ranking elected LGBT official," Lake said. "Eileen has demonstrated her commitment to justice and equality during her tenure on the Governor's council and I look forward to serving with her to uphold the integrity of our justice system." More info on Lake and the campaign can be found at ElectMikeLake.com. Democratic Candidate for Lt. Governor Mike Lake was officially endorsed by State Representative Frank Smizik of the Fifteenth Norfolk District. Smizik is the second elected-official from Brookline to officially support Lake,.